1) MXR Chorus (bottom image) uses 2 halves of U1 as input buffer and active filter. I did a simulation and realized that you can get a similar result using only 1 half of an operational amplifier, as is done in the MXR Flanger scheme(upper image), just change several ratings to get a similar filter. Is there any advantage in the form of a separate filter and input buffer against the classic non-inverting amplifier in the MXR flanger circuit, both have high input impedance and the same cutoff frequency, what reason to use more components? 2) Regarding the Flanger. In many Flanger circuits, I see an inverting amplifier with a symmetrical clipping(U2). What role does it play in this type of effect. I saw a similar cascade in the BOSS BF-2 and Ibanez FL9 & Airplane. I understand that it limits the peaks of the signal, but from a technical point of view I do not understand why this is done. Clipping and feedback is the main difference between Flanger and Chorus (apart from delay time)? Why is this amplifier inverting? Why change the phase, because you can just put a non-inverting amplifier. 3) What does the Manual controller do? Does it change the frequency on which the LFO works? Or does it change the delay time? 4) I'm confused about what Q1 + Q2 + Q3 + Q4 do. Please tell us in detail their principle of operation or what is the name of this design. As for input buffer,, might mean a few more parts but they have huge advantage, Isolation! Without trying to show off how little I know about the tecky maths lol,, I'll just stick to what I worked out from building stuff and then had it confirmed by reading lots of tech books. The buffer converts a high Z input to a low Z output. What for ?? NOISE is the enemy of Hi Z circuitry and a buffer stage goes a long way in keeping the S/N ratio to a minimum. Just build a TS circuit with an input buffer and then without. With No buffer you will get more gain and dirt but you can't use the extra gain because the noise renders it unusable. IMHObservation after 30 plus years of messing with circuits,,, If you need a noise gate you likely have a crap design. 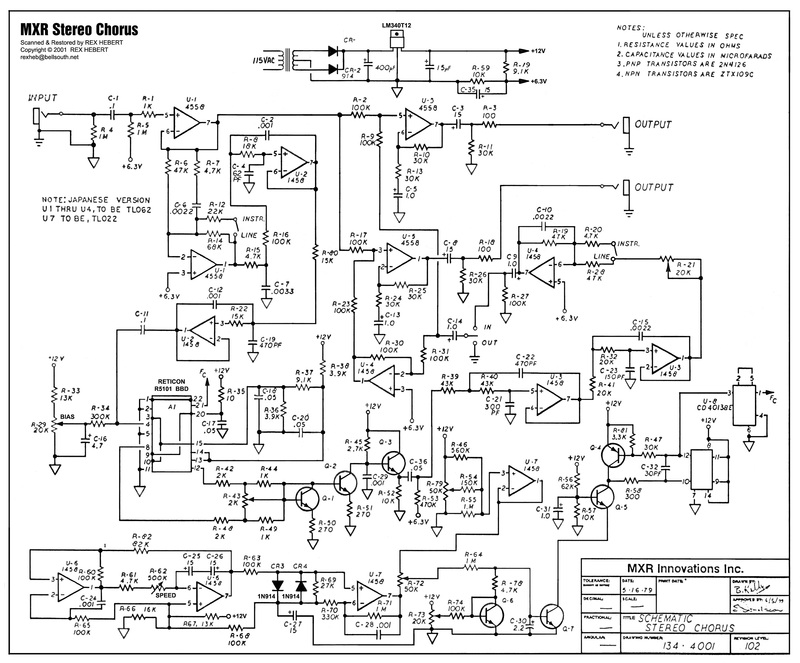 A lot of fancy brands remove the buffer and claim all sorts of BS but it's a no brainer for brands like Rane whose schematics are full of buffer stages on every input. My old Quadraverb,, first thing in the signal path is a buffer. Why? because they KNOW what the result will be if you skimp. Not sure about the rest of the post ,, I got a bit lost as to what you meant but better minds may know more. phatt wrote: As for input buffer,, might mean a few more parts but they have huge advantage, Isolation! I know why I need a buffer. But let's take a look at the schemes from the technical side. That is, there is no difference in impedance (30K is equivalent to the spread of components). This is one of the charms op amp that we can simultaneously create amplifiers filters and buffers using one half of the chip. Yes both inputs are HiZ BUT one has gain the other does NOT!! If you have substantial gain with a HiZ input on the same device then it will be far more noise prone than a Buffer/Follower. If the gain is low enough at stage one then you might get away with it (In this case the flanger has a gain about 10) but the pro's know it's better to play it safe and convert HiZ down to lowZ right at the input. IIRC, The Art of Electronics has a few pages on how to circumvent noise issues in audio circuits. You can use the best opamps on the planet but that won't magically fix noise in a badly thought out circuit. Go back and Breadboard that TS circuit and A/B test for yourself. Hang a 1Meg R off pin3 and a 1 Meg pot between pin 2&1 then insert a simple BJT buffer. Even if you adjust so both have the same gain the circuit with the buffer stage will have better noise figures. With one pedal in your signal path it may not be obvious but if you chain a lot of pedals together all with noise problems then it's a nightmare. phatt wrote: Yes both inputs are HiZ BUT one has gain the other does NOT!! Yes you are right, maybe it makes sense. But do you consider the gain factor of 10 sufficiently large for the appearance of noise? If you only have a couple of pedals in the signal path any noise will be so low you won't notice BUT on the other hand a chain of pedals (that may also have inherit design flaws with noise) then it can become a real problem. Designing audio mixers presents similar problems with S/N. You design one channel and it may sound impressive. But with 24 or more channels all active that tiny noise issue with your one channel proto gets multiplied and it not as good as you thought. In the case of pedals (all circuits in series) it's an even bigger issue as only one pedal may have a hidden noise issue and if following stages have substantial gain then that noise gets multiplied. You often hear the term "Pedal friendly" Amp or "Takes pedals well"
Most lower gain Amps will take pedals and have no noise problems but hi gain rigs can be really noise prone,, because the Amp adds even more gain to that noisy pedal,, That same Amp may work ok if the pedals were better designed. The trick is trying to work out just where the noise is coming from?? Is it that pedal, or is it that extra triode stage in the amp?? Swapping the pedal sequence around can often help find the culprit,, or swapping amps. If you are like me you eventually find a setup that works but you learn a lot along the way. I have a cheap Valve amp with an extra 2 stage triode drive and it's dead quite (clean or drive) I have to have 3 distortion pedals engaged on the Drive channel before it starts to get noisy.